So there I was, minding my own business and reading the Sunday New York Times, when I came across this full-page ad from an outfit called – honest! – Truth in Advertising. Seriously? Truth in advertising? This has to be, like, Jimmy Fallon, right? 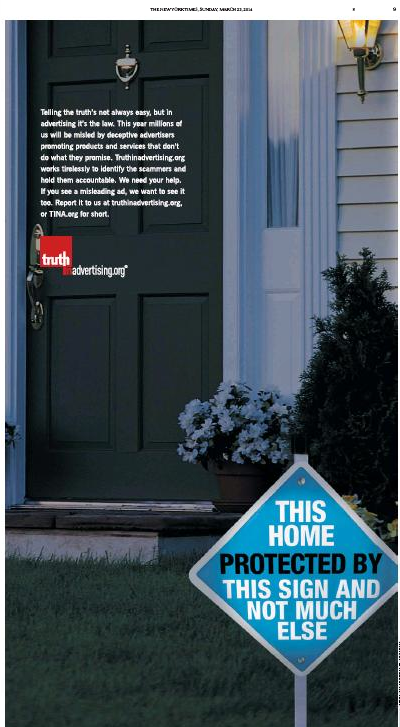 First off, here’s the ad’s body copy for the body-copy impaired. Second off, here’s the Truth in Advertising website. And third off, here’s the Truth in Advertising Mission Statement. 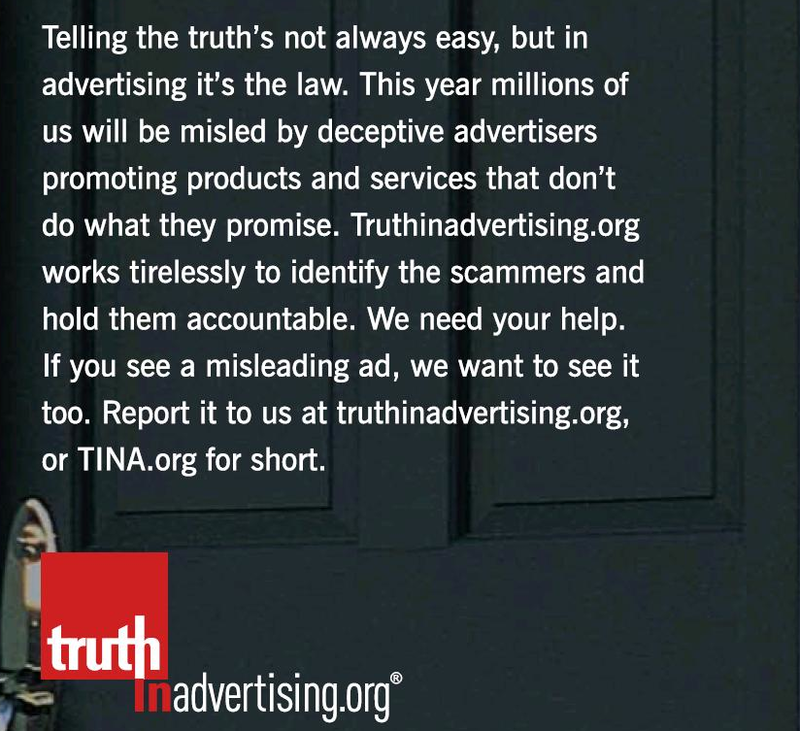 Truth in Advertising, Inc. (TINA.org) is a 501(c)(3) nonprofit organization based in Madison, CT, whose mission is to be the go-to online resource dedicated to empowering consumers to protect themselves and one another against false advertising and deceptive marketing. We aim to achieve our mission through investigative journalism, education, advocacy, and the promotion of truth in advertising. Got that? Now on to the good stuff, which, of course, always involves video. Well, maybe not exactly good. But not exactly bad either. 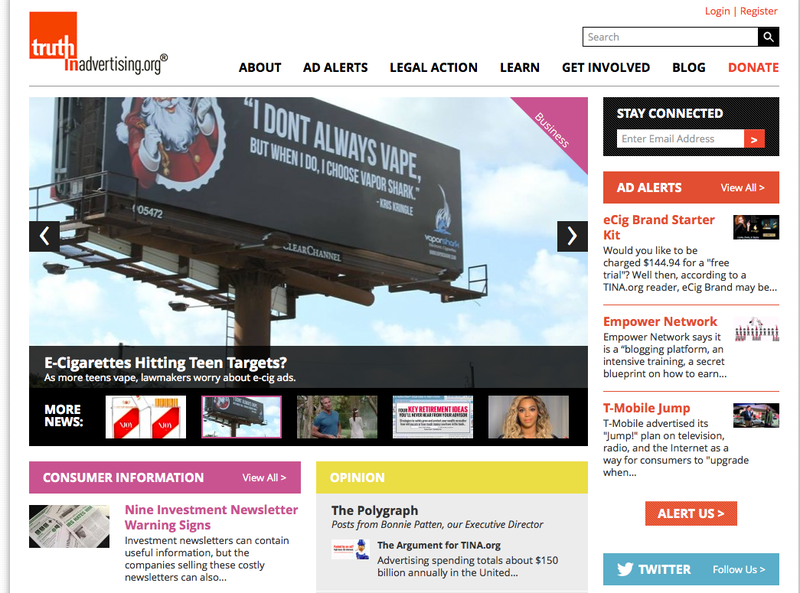 The TINA campaign features that web video, along with print and digital ads in the New York Times, the Wall Street Journal, USA Today, and etc. Presumably, they’re telling the truth. So the Doc asked the other day, Who Is Fr. Roy Bourgeois and Why Did He Run an Ad in the Boston Globe? And etc. 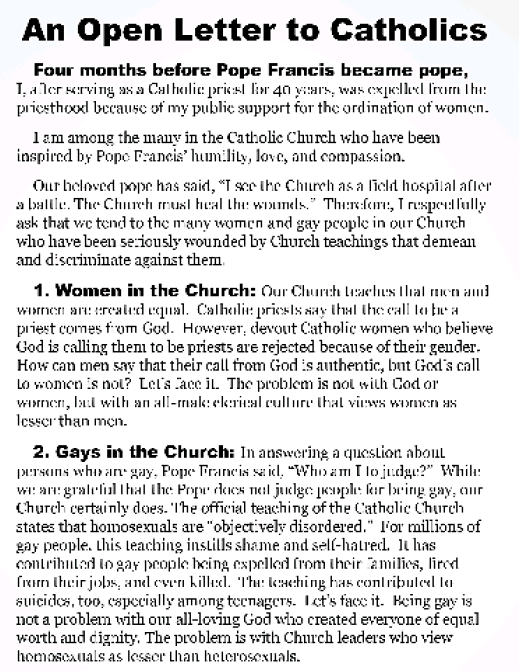 (including a call for people to contact Pope Francis to “request that our Catholic Church ordain women, accept LGBT (lesbian, gay, bisexual, and transgender) people as equals, and recognize gay marriage”). As for our question, we answered the who in our original post. He has friends here because he attended seminary in Hingham and has given talks in this area numerous times. The response has been good, Fr. Bourgeois says, and he has no intention of recanting his support for women’s ordination, even though it could return him to the priesthood. “Asking me to do that would violate my conscience,” he says. Fr. 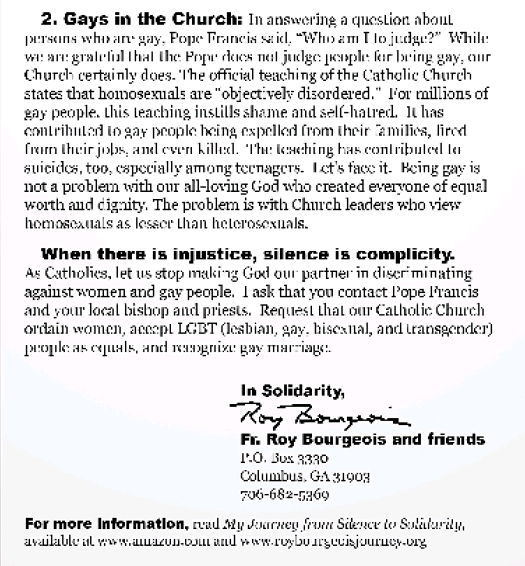 Bourgeois has himself contacted Pope Francis, but has yet to receive a reply. Meanwhile, he says, it’s “just a matter of time” until women (and other disenfranchised groups) are justified by the Catholic Church. Who Is Fr. Roy Bourgeois and Why Did He Run an Ad in the Boston Globe? Really? Some Catholic priest in Columbus, GA has enough dough to buy a quarter-page ad in the Sunday (week’s most expensive) Globe? What’s the deal here, Doc? And so it goes, as Vonnegut would say. So it goes. 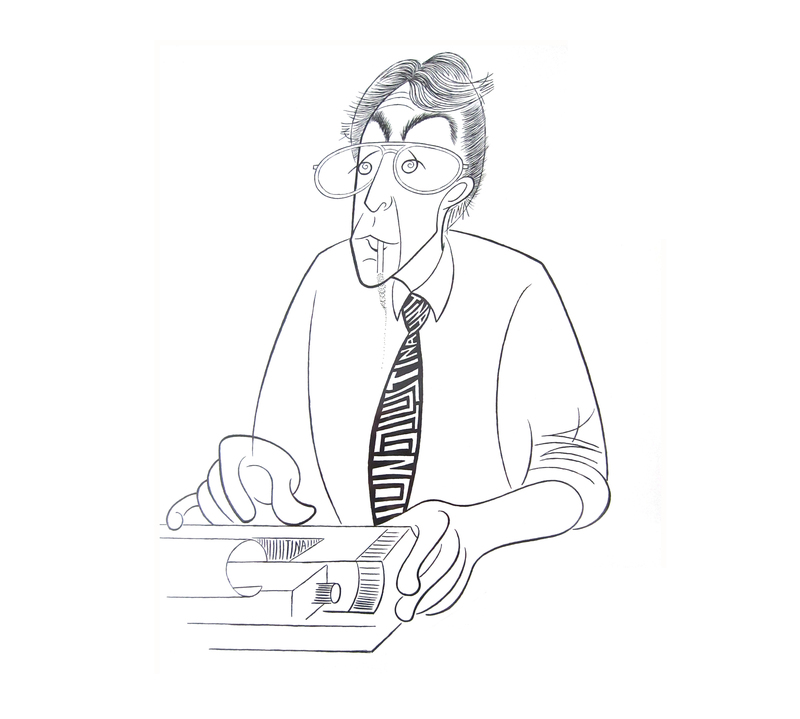 Bourgeois’ case is a prime illustration of what, today, the institution can and can’t tolerate. Bourgeois’ major offense, the sin that is unforgiveable in the eyes of the church, for which penalty is removal from the order which he has served for nearly half a century and dismissal from the community, was advocating for women’s ordination. AFTER serving as a Roman Catholic priest for 40 years, I was expelled from the priesthood last November because of my public support for the ordination of women. Catholic priests say that the call to be a priest comes from God. As a young priest, I began to ask myself and my fellow priests: “Who are we, as men, to say that our call from God is authentic, but God’s call to women is not?” Isn’t our all-powerful God, who created the cosmos, capable of empowering a woman to be a priest? Let’s face it. 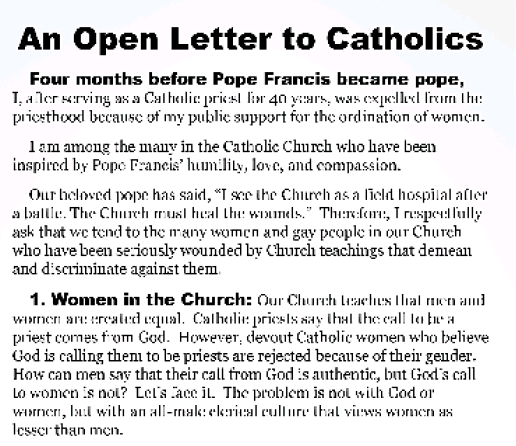 The problem is not with God, but with an all-male clerical culture that views women as lesser than men. Though I am not optimistic, I pray that the newly elected Pope Francis will rethink this antiquated and unholy doctrine. 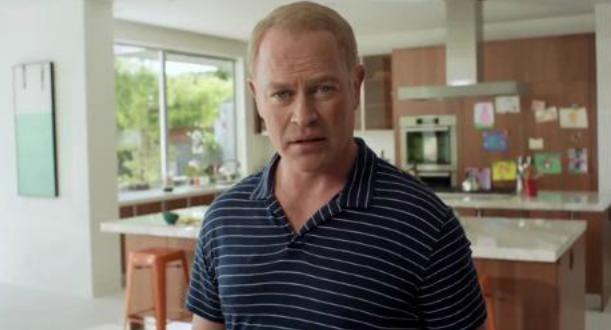 He’s also decided to pay, in the form of the Globe ad. The old Doc will try to find out. We didn’t find a way to contact him at his website, but we’ll track him down eventually and get back to you.